One-dimensional nanostructure of CdS thin films of various thicknesses have been synthesized by chemical bath deposition followed by dissolution-condensation (recrystallization) onto plastic, glass and titanium substrates. These films were examined for their structural, surface morphological and optical properties by means of X–ray diffraction (XRD), scanning electron microscopy (SEM), atomic force microscopy (AFM) and UV–vis spectrophotometry techniques respectively. Photoelectrochemical (PEC) investigations were carried out using cell configuration as n-CdS/ (1M NaOH + 1M Na2S + 1M S)/ C. XRD shows that the nanowires in the networks grow along the (002) directions. SEM shows the interconnect network of CdS nanorods/nanowires of final product. Band gap values of CdS films of various thicknesses lie in the range 2.43-2.49 eV. The studies such as current-voltage characteristics in light, photovoltaic power output and transient photoresponse have been carried out. 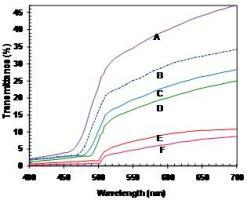 The PEC cell with nanocrystalline film thickness of ~ 913 nm is exhibited efficiency of ~ 0.343%. CBD-CdS; Nanowires; XRD; Surface morphology; Photoelectrochemical cells; Optical property.